Lucy Wagstaff was a most remarkable doctor, teacher and researcher at Baragwanath Hospital and the University of the Witwatersrand, during the apartheid years and subsequently. When I joined the Department of Paediatrics and Child Health at Wits in 1971, I immediately became aware of Lucy as a very caring and competent paediatrician. She had a special interest in the follow-up of patients after discharge from hospital, at the outpatients department or at community clinics, and in the process got to know, teach and encourage the nursing sisters involved. She often spent weekends assisting at mission hospitals, such as Jane Furse in the then homeland of Lebowa. The first black social worker in paediatrics at Baragwanath Hospital, Mrs Esline Shuenyane, together with Mrs Avis Schreier of Johannesburg Hospital Paediatrics, worked with Lucy to expose medical students to home-care of paediatric patients. Medical students were designated patients to follow up at home and to report back at tutorials for discussion. The programme worked very well and was one of the first to introduce students to community health care. Crisis came with the 1976 Soweto riots, with the closing of community clinics and the flight of their doctors. Baragwanath Hospital was thus overburdened with outpatients. Lucy Wagstaff put forward the idea that competent senior nurses from the hospital, after a short course of instruction on diagnosis and treatment, might be able to run the clinics without doctors. The administration gladly supported this idea and training courses, co-ordinated by Lucy, were set up by medical and surgical staff. Within 3 months clinics began to function again. Lucy's innovative measure of nurse-led primary health care service became a model replicated countrywide. Lucy played an important part by frequently visiting clinics (driving alone) to encourage and guide where necessary. A survey, sometime later, revealed that the sisters were as competent as doctors had been in coping with 80% of the patients; the rest were referred to the hospital. In 1976 the Loewenstein Trust established a Chair of Community Paediatrics at Wits, to which Professor Wagstaff was appointed. She held this Chair with distinction until her retirement from academic paediatrics in 1997. Among her local achievements, apart from teaching under- and postgraduate students, was the creation of day-care centres for children of working parents, in the homes of non-working mothers. She was the organiser and took part in doctor schedules for weekend visits to Swaziland and elsewhere in Anglo's Harry's Angels project, for over a decade. Many publications included diverse fields, such as infant growth and nutrition, school health and medical education. 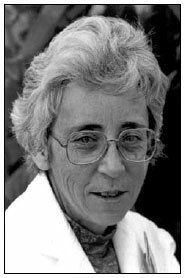 Lucy Wagstaff was the co-editor with Professor M A Kibel of a textbook Child Health for All, a manual for southern Africa, for the first two editions in 1991 and 1995. She was convenor and examiner of the Diploma of Child Health (DCH) of the College of Medicine, South Africa. She was also a Fellow and Examiner of the Royal College of Paediatrics and Child Health, UK. As a person, Lucy Wagstaff was humble but compelling, always of a caring nature for patients and staff. She warmly entertained colleagues and overseas visitors at her home. Her retirement years were marred by a head-on collision with another vehicle in Soweto, resulting in severe injury from which she only partly recovered. Lucy Wagstaff can be regarded as an example of what a caring and dedicated doctor can achieve in a developing country such as ours, during changing and often very difficult times. Reprinted from: Wits Review 2009; July, 59.